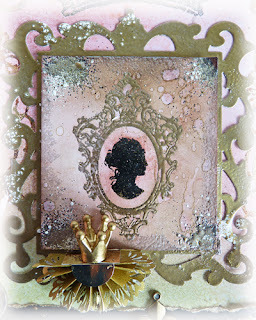 I was inspired by Jill's (Mrs Stamp Man) blog post a while ago, using Stampendous stamps and the Frantage technique, and combined some of the powders to create my DT card for this challenge. The backing card crown has been stamped with embossing ink and I used a mix of embossing powders (see supplies), then blended with DIs and stamped with flitter glue on the edges and covered with variegated red gold gilding flakes. On top of this I added a cameo also embossed with gold and black and again blended with DIs and flicked with water. The frame has been embossed with gold too. Well a queen just has to have lots of precious metals around don't they? The half rosette was made with a border punch and I made it into a small shelf to hold another crown. 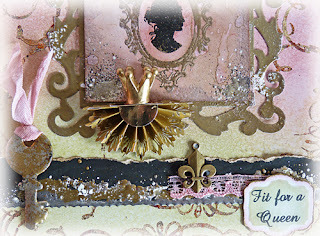 The key is a vintage one covered with Frantage embossing enamel powders and the sentiment computer produced and die-cut with Nestabilities. Tim Holtz distress inks - Victorian Velvet, Bundled Sage, Frayed Burlap. We would love to see your regal creations this fortnight at The Stamp Man challenge and don't forget you have a chance of winning a £10 voucher for Jill's on-line shop. She has made this gorgeous ATC holder and entered it into Tuesday Treasures, little did I know she had made it for me, but when we met for coffee in the week she presented me with it. Thank you Irene I love it. Thank you ladies, I really appreciate this fabulous prize. Update on my dear hubbie - he had his gall bladder taken out yesterday and is home today - amazing this key hole surgery you know. Anyway he had a huge amount of tiny stones in it so hopefully all the pain he was experiencing will disappear now. This is definitely a regal card, Brenda...stunning details....congrats on your wonderful gifts....best health wishes for your hubbie! GREAT news about hubby's op, hope his recovery is textbook too. LOVELY project - defo fit for a Queen! Just brilliant, I so love the little shelf with the crown on, what a great idea, I would never of thought of doing that.Brenda, bless your heart, you are more than welcome. Would love to see what ATC's you put in your folder. Glad Ken's op went OK, hope he recovers soon. wow, stunning card! have a nice weekend! OOooh - I love all the bling on this right royal piece of gorgeousness Brenda! All the elements are fantastic, but one thing I absolutely adore is the little shelf you created from half a rosette - perfect for displaying ones crown! Hi Brenda, This is a fabulous card, love the effects you have achieved. Hope DH is well on the mend now after his op. Beautiful card, Brenda, and I'm sure it's even more impressive in real life. So glad Ken's surgery went well, and hopefully he will soon be feeling better. Beautiful card, glad to hear your dh is doing better. Gorgeous card, love the shelf, the embossing looks fabulous. First may I reassure you that Hubby will feel heaps better now that he has had those stones removed, he can survive without a Gall bladder, he may not be able to tolerate certain foods but he will learn quickly!!!!! Secondly; your card epitomises the true essence of Regal. Gosh where do I begin in relaying to you all that is gorgeous about this creation, the Victorian velvet is the perfect colour along with the Gold accents, you have texture, dimension, and your Key is such a wonderful Tactile element, it is just so elegant and dare I say Royal! A beautiful card, great texture and elements. Brenda this is fit for a queen !! 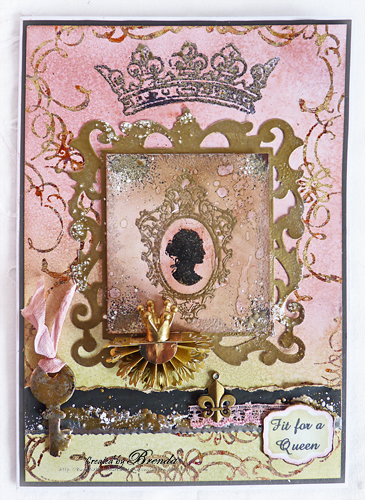 Love the blingy gorgeousness here, the soft pinks and the gorgeous design on this super royal card.